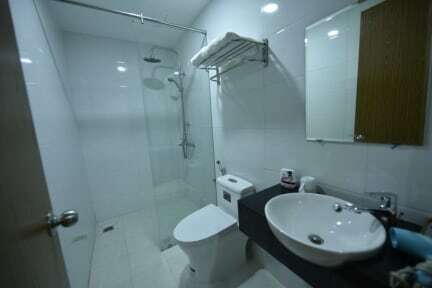 Ibiz City Hostel is located central of Hanoi. It is designed by ancient and equipped with modern facilities. We are setting up the private room and domitory room. There are many choice for the tourists. After check in, you will have chance to relax at the bar with traditional music program. Rooms are air-conditioned and feature tiled flooring. They come with satellite TV and free Wi-Fi. Ibiz City Hostel offers concierge services and ticketing service. It also provides bicycle rental, as well as car rental. An airport shuttle can be arranged with additional charge. Breakfast and other meals are served at Ibiz City Hostel’s restaurant. Refreshing beverages can also be enjoyed at the bar. 4. Payment upon arrival by cash or credit card, but extra charge for credit card service fee. Had a great stay at Ibiz. Really great service, the receptionist came to get us at the end of the street with an umbrella as it was raining, we were really happy! Bathroom and dorms clean, well located! The only thing i didn't like was that some beds are double and they put you with a stranger.... So specify that you want your own bed next to no one aha. Overall great stay, i would come again. Shout-out to Qinh the barman who was super nice and makes the best old fashions! It was very stay here in Ibiz City Hostel. The staff was friendly and helpful. Moreover, the location is good and close to many famous places such as Hoan Kiem lake, Dong Xuan market, Church and so on. I would love to stay here again next time. valuable hostel with good location and helpfull staff! the receptionist check in the room early morning for me without extra fees.I also had buffet breakfast with lots of fruits.It is the most delicious breakfast which I tried on other hostels. the room with city view and clean bed and bathroom as well. Strongly recomend Ibiz city hostel . I stayed in Ibizcity hostel for my first time in Vietnam.I really enjoyed to stay here.The staff was very helpful to have some advices for me during few days in Hanoi.I booked Halong bay 2days 1night on Aclass cruise.It was amazing boat and organized well. Addition, I stayed in domitory room with clean sheet bed and change the towels everyday and bạthroom inside, hot shower with strong pressure. Be located in the centre of city with lots of restaurant and bar bub.Defintedly recomend Ibiz hostel. I really liked this hostel! I would say a major down side is having to walk up 4 to 6 flights of stairs just to get to your room! I was at the very top, but chose to see this as a work out, rather than the hostels fault. The hostel was great for hanging out, meeting people, and drinking. I also really liked the beds here. They were very comfortable! Great location , clean , very helpful staff and amazing breakfast! Bathtub in dorm bathroom which was nice Clean and spacious and we had a dorm to ourselves as a family of 5. Dorm was 4 floors up so you need a fair level of fitness. If you dont get to breakfast early you miss out as they only replenish the coffee and bread not the hot food. One local fellow enjoyed bonging on each night right at the front door that also wafted up to our room and at the entrance to the hostel. The staff were okay not friendly but not rude and helpful when asked questions. This place was kinda just alright, there is a bar at the bottom of the hostel but it didn’t feel particularly social. They do have an awesome breakfast buffet that kinda makes it worth staying here haha. It is a great location though, right in the heart of old town. The facilities were just alright, the shower was basically just an open tub with a shower head, no doors or curtains...pretty odd lol. This is the kinda place you stay when you just need a bed.